Phytophthora foot rot (quick wilt disease) caused by Phytophthora capsici is the most destructive of all diseases and occurs mainly during the south-west monsoon season. All parts of the vine are prone to infection and the expression of symptoms depend upon the site or plant part infected and the extent of damage. But root infection might continue even up to October as long as soil moisture remains high. 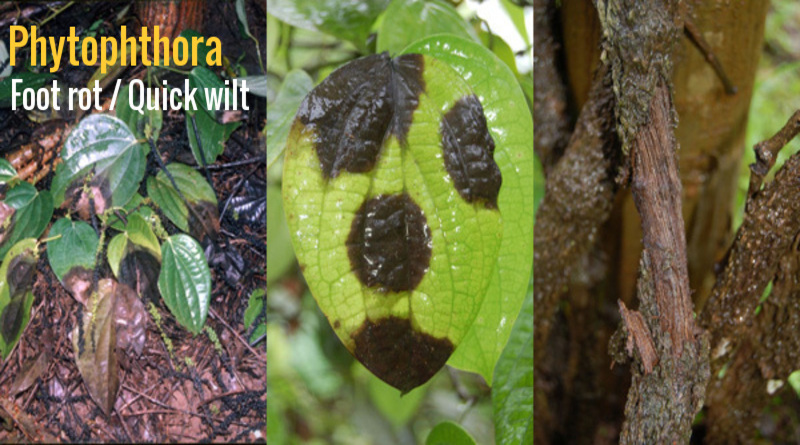 During south-west monsoon period, one or more black spots appear on the leaves which have a characteristic fine fibre like projections at the advancing margins of the spots which rapidly enlarge and cause defoliation. The tender leaves and succulent shoot tips of freshly emerging runner shoots trailing on the soil turn black when infected. The disease spreads vertically to the entire vine, from these infected runner shoots and leaves, during intermittent showers due to rain splash. If the main stem at the ground level or the collar is damaged, the entire vine wilts followed by shedding of leaves and spikes with or without any black spots on leaves or tender stem. The branches of the affected vines break off at nodes and the entire vine collapses within a month. If the damage is confined to the roots, the affected vine exhibits gradual yellowing, defoliation, wilting and drying up of a part of the vine during the post-monsoon period. These vines might recover after the rains and survive for more than two seasons till the root infection leads to collar rot and death of the vine.